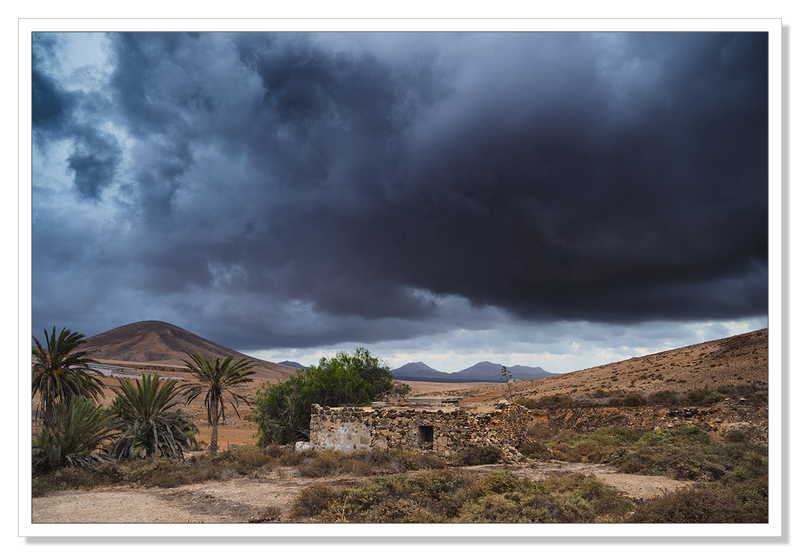 When the sun doesn’t shine..
On my recent visit to Fuerteventura, out of the 23 days we were there, we had two really quite stormy days and rather than spend my time, as so many visitors appeared to be doing, wandering around shopping malls looking thoroughly miserable, of course for me as a photographer, this was an opportunity. I grabbed my camera and headed off into the mountains but not before catching one last photo of the sunshine on the beach before the clouds finally took over completely. If you look closely, down in the bottom left, you can just see a tiny red flag on the beach indicating it was no longer safe to swim on what is normally a very safe beach indeed. Stormy weather indeed! What was wonderful to see after the rain, just a couple of days remember, was the scrub and even the sand come alive with green plants and fresh green shoots. It was as if spring had arrived in the island though of course it was autumn. 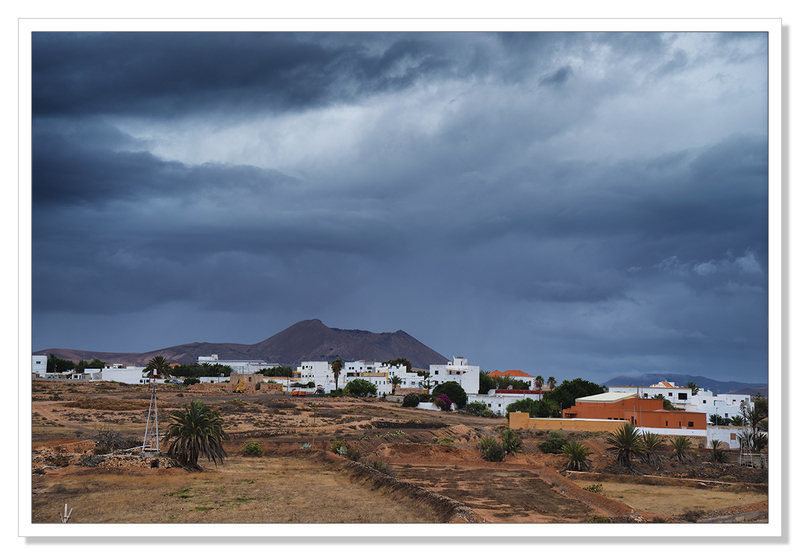 Fuerteventura is a wonderful place to visit and I can recommend it to anyone. For me, in the off season, this is the very best time to visit even though you can’t be guaranteed that every day will be clear blue skies, that’s perfect for me and my camera. This entry was posted on November 18, 2016 by Chillbrook. 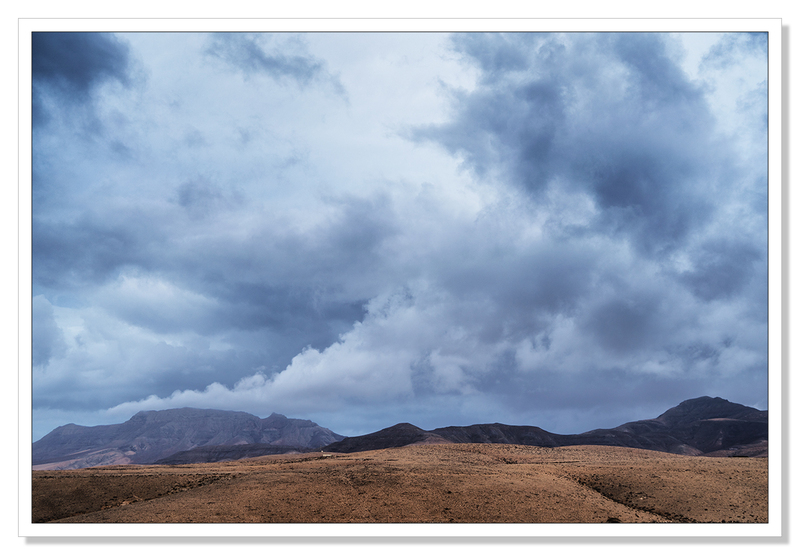 It was filed under Photography, Photography and Travel and was tagged with Adrian Theze, Autumn, Beach, Fuerteventura, Landscape, Landscape Photography, Nikon D800e, Photography, Seascape, Storms. Very nice! 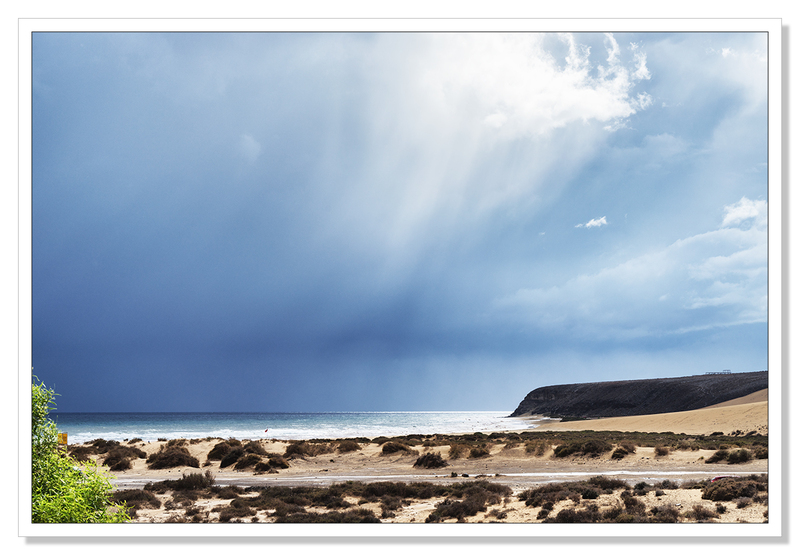 thanks for sharing your photos of Fuerteventura, they are gorgeous. Remarkable skies! I love how threatening and beautiful they are. Your photography is always breathtaking, Adrian! Great landscapes, especial I like this photo with windmill. It is great to make photos after rain, becouse then plants become more beautifull then in other days. Rain gives plants vital force what just rain can give to plants. Lovely gallery, Adrian. 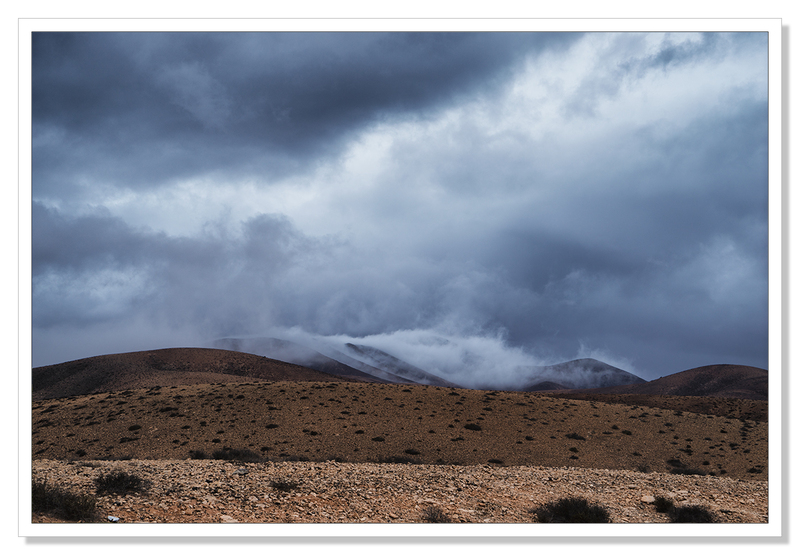 I really like the atmosphere in the first of the inland image, with the clouds or mist spilling between the ridges. And what a fab windmill that is. Lovely images Adrian…….didn’t realise you were there for over 3 weeks…..nice one! Great images in the changing weather, Adrian! Impressive photos, Adrian. The details of the clouds, the fog and the rain falling are stunning! Did you use any filter for these? I love Fuerte. Great pictures, really atmospheric. No sunshine but breathtaking pictures. 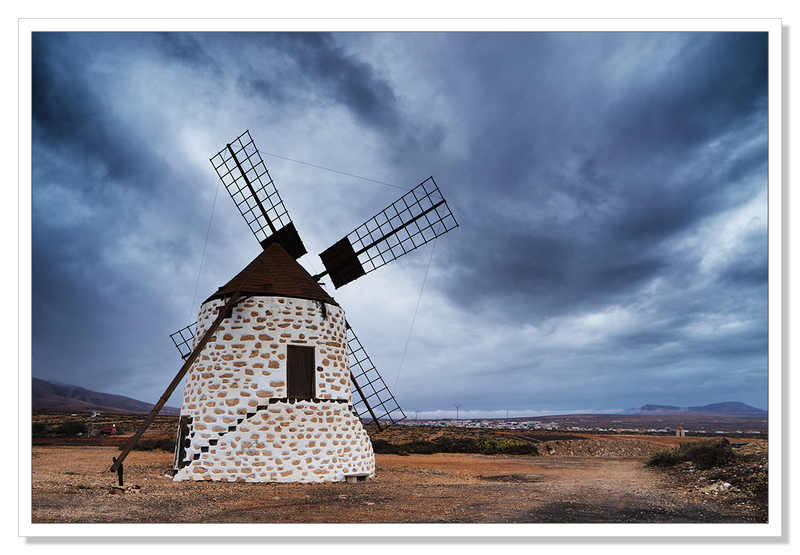 Wonderful, wonderful, skyscapes , landscapes and a striking windmill. super stuff. You may have noticed that I tend to love this sort of weather as well. You did some great shooting given the marvelous show in the sky! We are currently in The Rhine Valley, sending you both lots of love. What a fabulous sky! As a picture, I particularly like the fourth one; the little house (?) huddled in its garden of palm trees seeming to battle the odds of the harsh terrain around it and the threatening storm closing in. I can’t quite see but it looks derelict/ruined anyway which adds to the emotional pull. Great shot! Even in the first photo, with the sun still shining on the beach, that sky looks very threatening. The clouds are beautiful and in many ways are more interesting than clear blue skies. I’m glad you decided not to wait out the rain at the shopping mall! Love the drama of the skies Adrian – and agree wholeheartedly that off-season is the ONLY season anywhere that tourists flock! Great set of images, Adrian! I love the colours and dramatic skies! Nothing like dramatic skies, and you’re a master at bringing them home. There’s something to be said about these heavy, cloudy days. They make beautiful images. And I love that windmill. Such a lovely place, Adrian. I really love that windmill. It has quite a comical look. :) What stunning skies you captured, too. Definitely much better than wandering around shopping malls. Wonderful drama and details, Adrian. The clouds/fog crawling over the hills, the charming windmill. Terrific series. You’re a true landscape photographer and not a tourist. Great photography as usual.